My brain hurts after watching this incredible lecture “Predicting the next 5000 days of the web” by Kevin Kelly (of Cool Tools) from the EG 2007 conference. The web is seriously only 5,000 days old. It’s changed our world forever. What’s to come in the next 5,000 days?!!! “There is only One machine. All very very true, but still,my head hurts but I love it! Now go watch this video!!!! Can You Guess Where My Accent is From” game! Think you know where people are from based on their accents! If so, give this 5 minute game a go and yell at yourself when you guess wrong, especially when asked the regional questions. Do the test just once since the questions are the same if you repeat. My first try was in the upper 20’s. 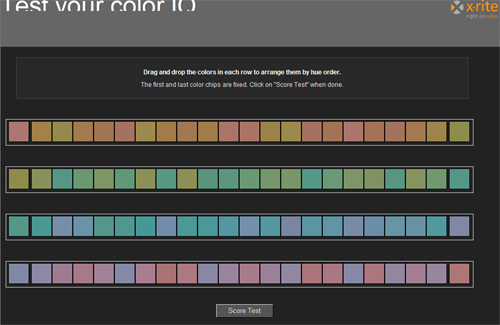 After that, go test your color IQ (or find out how color blind ya are), then do a few cultural tests at alllookthesame.com (art, architecture, food, faces, etc). Then for a bonus, see if you can spot a Fake smile test! – New Dillar Scofidio + Renfro website is up! – Punching Cat vs Printer video. – Kenny George, a 7’9″ college Basketball player! (video)The dude dunks standing! – A peek into the Youtube Headquarters. – Magic Mirror technology … making any shirt a customized ad…scary! – Remote Control your houses energy with Ploggs. ReConstitution 2008 – Live Presidential Debates Remix by Sosolimited from Sosolimited on Vimeo. ReConstitution 2004 – Sosolimited from Sosolimited on Vimeo. “ReConstitution is a live audiovisual remix of the 2008 Presidential debates. There will be three performances in three cities, each coinciding with a live broadcast of the debates. I attended this event in 2005 and it was awesome! The extra information revealed visually based on spoken and visual content from each candidate was incredible. Data mining in it’s simplest form in a very cool way, especially the barrel of words! Watch the 2 videos above (1 summary of what they are doing this year, and the lower video giving you a peek into the 2004 remix) for an understanding of this event, attend if you can for the next rounds in NYC and DC then check out the rest of sosolimited’s projects on their website!. Our buddy Bre Pettis has a pretty sweet TV show piloting tonight! Check out his post with more info or give it a watch at midnight on the history channel. Watch the teaser video above or here. A few months back I drove by a parking lot and saw 2 dudes skating around spinning around like mad men. The weird part was, I couldn’t see their skateboards. I thought weird and straightened my head avoiding the traffic I almost ran into. I’ve finally realized what these bizarre inventions are. Their called Freeline Skates seemingly like mini skateboards for each foot, somewhat resembling sideway rollerblade besides the fact it’s not strapped to your foot. This is some pretty crazy weird stuff. That’s all I can say, but it seems to be making a blaze across the world! Check out the video above or their website for more info. Thomas Kalak: Thailand – Same same, but different! Photographer Thomas Kalak sent me his new book “Thailand – Same same, but different!” containing a colorful variety of street improvisations containing creations in leveling objects in challenging environments, sourcing water in unique ways, making broken products useful, converting objects into other uses, and a variety of other everyday needs. The photos are simple, mind-provoking, and very humorous once you realize the entire story. You’ll look at an image, wonder what they were solving, realize the initial problem, then understand how they solved it. Each image is a puzzling fun story in itself. We live in a culture where resources are abundant, but at times we also find ourselves sourcing our needs around what we already have. The art in improvising is one of the most elemental needs in creativity just as “perspective” is to creation. Just because something is made to do “this” does not mean it cant’ do “that”. Thomas has created a wonderful simple book giving us a lens in seeing such beautiful samples in Thailand! A little bird tells me this is selling out fast! Get your orders at RupaPublishing.com or direct here! A few pictures from the book after the jump provided by Thomas! This is just way tooooo coooool! Artist Sandy Smith brings us this colorful creation. I want I want! Apple’s viral “I’m a Mac” ads tainted images of PC users over the years and Microsoft just launched a reply with their “I’m a PC” ads (not the semi failed Seinfeld ones, though buzzy) which surprisingly are pretty good. It’s not bashing Apple at all, and not saying I’m better than you or anything else. It just says hey, look at who uses a PC. No mud slinging, no joking, just purity which I frankly really like over their past “Perfect Family Lifestyle” ads that none of us connected with. “I wear glasses, I wear jeans, I have a beard, I’m a human”. There are quite a few celeb spots in the ads and there is a definite tone about the shear number of users out there vs “other” computers. Transparency in brands, relationship to customers, ability to connect, truth, being nice…. yes… all good things. Anyhow, I’m not here to say who is better, but it’s great to see this reply from MS. I don’t say this often, but bravo Microsoft! I’m liking you a bit more…. and yes, “I’m a PC”. EveryMomentNow.com has a pretty cool interactive visualization by designer Craig Mod depicting the amount of news published about both presidential parties Obama vs McCain. The obvious shift in news occurs in early September during McCains wild announcement for Palin. Will be a good visualization to watch out for in the weeks to come, though it sometimes acts up being viewed in firefox.